Are you tired of looking at same old kitchen sinks? Do you want your kitchen to stand out by installing an elegant and unique sink? ROHL Apron Front Farmhouse Sinks are just what you need. If we go back a decade in time, kitchen sinks were not things of beauty. Limited designs, stereotype construction in standard shapes and sizes, and basic functionality were enough to satisfy the old consumer. ROHL understands that sinks are now much more than just overlooked kitchen equipment. 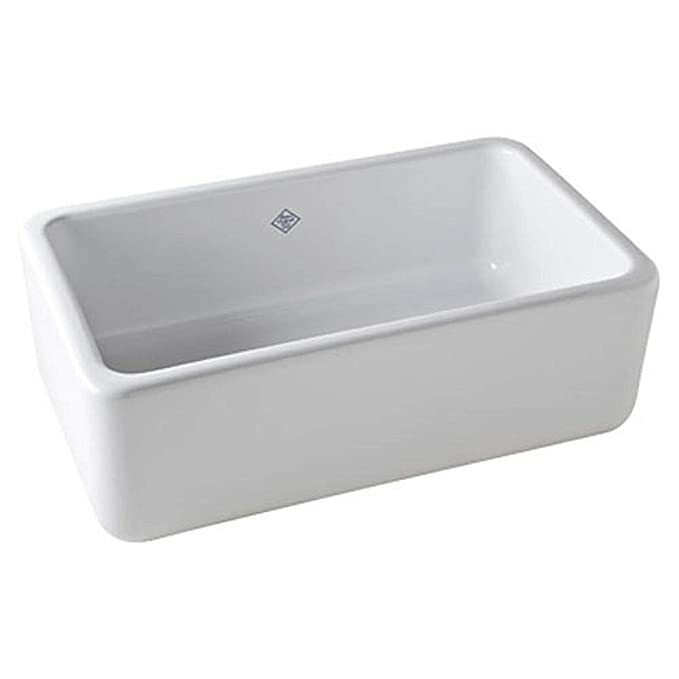 The RC3018 Shaws Original Fireclay Sink is one of the best options for your kitchen. It adds sheer elegance and provides optimal performance. Here is a detailed review of this classy kitchen sink from ROHL. To understand the benefits of ROHL RC3018WH Kitchen Sink, it is essential that you first get an overview of its most prominent features. Before we get to a summary of all the pros and cons of this elegant kitchen sink from ROHL, we wanted to give you its in-depth review with everything that we liked about it. We used this sink extensively for over a week to get a complete understanding of all its good and bad characteristics. Read on to find what you will surely love about this kitchen sink. Every sink in the ROHL Apron Front Farmhouse series is handcrafted and stamped with the name of the artisan – no two sinks are the same. You get an impeccable design which has a certain unique look when you install this sink in your kitchen. We highly appreciate the natural, aesthetic look of this sink that goes well in all kitchen settings – modern and conventional. It is far from a standard stainless steel sink that is used in most basic kitchens. You will get a ton of compliments from people who see this masterpiece in your kitchen. The fireclay single bowl build of the sink provides optimal functionality and can be easily coordinated with most kitchen themes. We especially liked the ergonomic design that makes all cleaning and pot filling tasks convenient and time-saving. You will like this sink as it is spacious enough to accommodate oversized pans and pots without looking too bulky in your kitchen. There are only a handful of kitchen sinks available in the market that provide great functionality and add a lot of elegance, and ROHL is our top recommendation from that lot. This kitchen sink from ROHL weighs over 150 pounds, and the primary reason for that is its best-in-industry durability. After using this kitchen sink, we can vouch for its thoughtful, sturdy build. It can withstand heavy use in the kitchen without any hassle. We cannot emphasize enough the importance of the alkali and acid resistant glazed surface on this kitchen sink. It is not only vital for the sink’s stunning look but also long-lasting performance. ROHL provides a 10-year warranty against staining or fading, which proves how strong its finish is. One of the essential features of any kitchen sink is its usability and easy maintenance, and ROHL’s RC3018 does well on that front. We loved how easy it was to use and clean this sink. We recommend that you get it installed by a professional only because of its weight. Also, you should consider getting a bottom grid for added protection. Any kitchen fixture will last longer if you take care of it and maintain it the way you should. As long as you do the needful, this kitchen sink from ROHL will not disappoint. To sum it up, ROHL offers some great products for you to choose from, and the Apron Front Farmhouse Series consists of top-notch kitchen sinks. The RC3018 is our top recommendation for its sheer beauty and performance. Your kitchen will get a significant upgrade after installing this kitchen sink.